I wrote this piece for CNN.com - click on the image to read the article. Although this is not a Middle East perspective, some of the readers may find it of interest. I wrote this as part of my work at CNN as a military analyst. Rick Francona: "Russian artillery is firing into eastern Ukraine...Why would the Russians do this? Simple -- this fits into their plan to support pro-Russian separatists in eastern Ukraine. The end game? I believe it is the eventual absorption of that region into the Russian Federation." The initial cadre of American advisers deployed to Iraqi to assess the capabilities of the Iraqi Army and the threat posed by the forces calling themselves "The Islamic State" (TIS, formerly the Islamic State in Iraq and [Greater] Syria, or ISIS) has provided its first report to the Pentagon. It is not good news; in fact, it is hard to imagine it being any worse. According to parts of the assessment of Iraqi military and security forces that have found their way into the media, the Iraqi Army is not capable of conducting an effective defense of the country. The report amplifies the remarks made by Chairman of the Joint Chiefs of Staff General Martin Dempsey at a news conference on July 3. At that time, General Dempsey said that Iraqi forces are capable of defending Baghdad, but do not have the ability to launch a counteroffensive to retake the areas now under TIS control without outside assistance. The general did not elaborate on his definition of "outside assistance." The assessment made by American military officers on the ground in Iraq goes even further, calling into doubt the ability of the Iraqi Army and security forces to hold Baghdad in the face of repeated TIS attacks. TIS has already begun a campaign of car bombings in the capital, and has made advances toward Baghdad International Airport and areas southwest of the capital. What happened to the Iraqi Army? The American officers' assessment points to some key factors. Iraqi Army units have become so ineffective because of the replacement of qualified officers of either the Sunni or Shi'a sect with less qualified (that's a polite way of saying unqualified) Shi'a officers with personal ties to Iraqi Prime Minister Nuri al-Maliki. According to the assessment, only half of Iraqi military units are capable enough that assigning American officers would do any good. The quality of the individual Iraqi soldiers has been subverted by poor leadership - mediocre troops with good leadership can perform well when required; conversely, good troops with ineffective leadership will normally fail when ordered into action. This is what we saw in Mosul and the Tigris Valley as the army seemed to collapse when faced with determined ISIS fighters. For my take on what happened to the Iraqi Army, see my article from June, Where is the Iraqi Army? There is another concern voiced by the American officers. They believe some Iraqi units have been infiltrated by Sunni extremists who are at best informants for TIS or at worst possible saboteurs who could pose a threat to American advisers. We all remember the "green on blue" attacks suffered by American forces in Afghanistan when our erstwhile Afghan allies turned on the embedded advisers, killing scores of American troops. 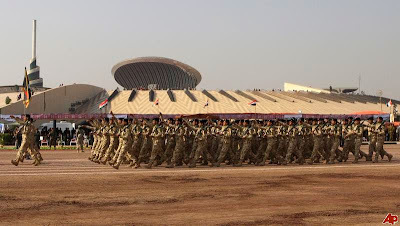 There are also fears that other Iraqi Army units are likewise infiltrated by Shi'a members whose primary loyalty is to their sect and may transcend loyalty to Iraq, raising concerns of Iranian influence in the Iraqi Army. That may also pose a safety issue for American advisers as well. There is also concern over the presence of Iranian militias in the country, as well as the rumored presence of two battalions of Islamic Revolutionary Guard Corps troops in Iraq. That should come as no surprise. 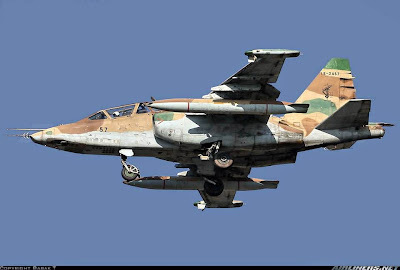 The Iranians have delivered at least five, likely more, Sukhoi SU-25 ground attack fighter jets to the Iraqi Air Force. I hope the Iraqis do not think that we are naive enough to think that the Iranians are not flying the jets - they have been used against TIS targets in Mosul and Tikrit. 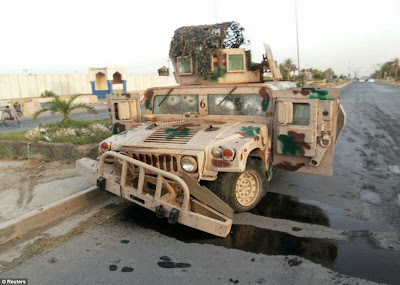 Meanwhile, the Iraqi Army has failed to retake the city of Tikrit back from TIS forces. There is a constant flow of official Iraqi media touting battlefield successes, yet the city of Tikrit is still in TIS hands. See my earlier article on Tikrit, The battle for Tikrit - bellwether of the future in Iraq? This assessment made by American officers on the ground in Iraq is abysmal news for the Administration and complicates future planning. Do we begin American airstrikes? Can they be effective given the sad state of the Iraqi Army? Are American ground troops a possibility? None of this bodes well for the future of Iraq as we know it. Israel and Gaza - disproportionate force? Israel's almost one-week long bombing operations against HAMAS targets in the Gaza Strip is reminiscent of similar conflicts in Gaza in 2009 and 2012. It follows a familiar pattern: HAMAS (or affiliated groups) launch rockets from the Gaza Strip into Israeli population centers, Israel retaliates first with an air campaign that damages the infrastructure of Gaza, followed by a short ground incursion that further damages public and private property, and then the international press excoriates Israel for its "disproportionate" response to the rocket attacks on its territory. 2014 is shaping up to be no different. The air campaign has started, and Israeli troops are positioned on the Gaza border in preparation for a possible invasion. 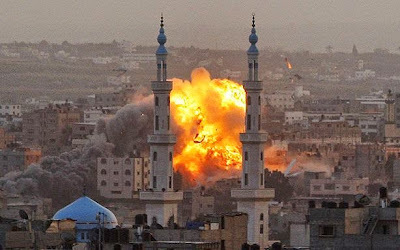 The bombing campaign had not been ongoing for more than a few days when the United Nations High Commissioner for Human Rights, Navi Pillay, demanded that the Israel Defense Forces and HAMAS abide by international law. However, she only addressed Israel's action in her comments: "We have received deeply disturbing reports that many of the civilian casualties, including of children, occurred as a result of strikes on homes. Such reports raise serious doubt about whether the Israeli strikes have been in accordance with international humanitarian law and international human rights law." Ms. Pillay did allow that the Palestinians are not without responsibility, saying that "all sides must refrain from launching attacks or putting military weapons in densely populated areas." Under international law, civilian homes are valid military targets when used for a military purpose. Let's talk about "disproportionate" when it comes to military force. First, some comments from an Arab observer. These are excerpts of an article that appears in Spookd, a blog written by a former colleague. Click on the logo and read the entire article to make sure I am not misrepresenting the guest author's comments. Based on the name, I am guessing that the author's family is originally from Jordan and they are of Palestinian origin. This whole conflict is a joke now. This breakdown of organization and the lingering, lasting effects of Israel controlling Palestinian imports [oil, gas, food, water, medicine, concrete, etc.] has led to this dismantling of the Palestinian society. I feel for my fellow Arabs, and I wish there were a peaceful solution for them. However, there isn't, and, although I don't condone Hamas shooting bottle rockets into the city, I equally don't condone Israel targeting charity houses and other civilian infrastructures. Israel has all the technology, and yet they show little remorse and empathy with the Palestinians. You can't compare the damage Israel has caused to what Hamas has done. Israel will always have more blood on their hands. Israel is being built by Zionists for Zionists and favors them over other citizens making those citizens less equal. They are building an empire tat will empower themselves to become the future world leaders. If we stay complacent and let them continue getting away with present day genocide, then eventually we will all be next. Stand up for the Palestinians, because if you don't, we will be next! First, this conflict is not a joke. Between the dead and wounded, there are over a thousand casualties in this round of the ongoing conflict between HAMAS and the Israelis. The overwhelming number of these casualties are in the Gaza Strip. There are a host of reasons for this disparity. Some have to do with technology, some with geography and others with political decisions. "Bottle rockets" is a grossly inaccurate term. 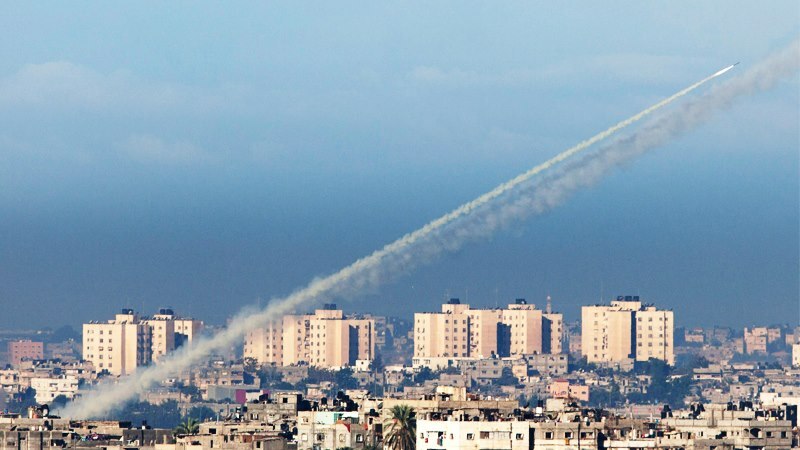 Granted, prior to the conflict in 2012, the primary weapon for HAMAS and the Islamic Jihad was the homemade, inaccurate al-Qassam rocket with a limited range, but enough of a warhead to cause significant damage to the border cities close to Gaza. They also were in possession of some longer range Grad rockets that could reach as far as Ashkelon, Ashdod, Be'er Sheva and even the southern outskirts of Tel Aviv. (See my earlier article, Sderot, Israel - "Rocket City" opens new school). However, since 2012 HAMAS has acquired - via Syria and Iran - an extensive arsenal of longer range rockets. This new arsenal includes the Iranian Fajr-5 (used to great effect by Hizballah in the 2006 conflict with Israel) and the Chinese-designed, Syrian-manufactured M-302 long range artillery rocket. The M-302 can deliver a 385 pound high-explosive, shrapnel-laden warhead to a range of 100 miles - that covers almost all of Israel. No, sir, these are not bottle rockets, these are modern weapons of war. As for comparing the damage done by Israel and that of the HAMAS rockets, and the statement that "Israel will always have more blood on its hands," this is typical of those who do not understand military conflict, or the American concept of overwhelming military force. That is the threat of the employment of so much violence that the enemy will not attack, or if it does, the infliction of an unacceptable level of death and destruction that the enemy ceases hostilities. War is not soccer - there is no requirement to "play fair." In Gaza, the population is packed into a small area with large, built up cities. The population density is at least 10 times greater than that of Israel. Dropping even precision-guided munitions (virtually all Israeli weapons are PGMs) into these close quarters will by definition cause civilian casualties (what is sometimes called "collateral damage"). Despite this well-known fact, HAMAS has shown no reluctance to place its rocket launchers, weapons storage areas and command centers not only in civilian areas, but actually in civilian residences and what we call "culturally sensitive" buildings - mosques, hospitals, schools, etc. In the wars in Iraq (1991 and 2003-2011), the Iraqis were fully aware of the American military's prohibition on striking such targets and used them for that very reason. It appears that HAMAS has made this same calculation. The Israelis try to limit damage to these areas and facilities, but do not operate under the strict American guidelines - just this week they struck a mosque used by HAMAS to hide rockets. To their credit, the Israelis have dropped leaflets warning of impending airstrikes in specified neighborhoods. They also have used what is similar to a "reverse 911" calling system to warn residents to evacuate building before they are struck, as well as dropping an empty shell on a targeted building - called "roof knocking" - prior to the actual airstrike. On the home front, the Israelis have an extensive warning system all over the country, combined with numerous bomb shelters. Most bus stops in the country are made of rebarred concrete to be used as shelters in the case of rocket/missile attacks or air raids. Perhaps the most effective defense against HAMAS's rockets is the American-funded, Israeli-developed anti-rocket system known as Iron Dome. Although it cannot cover all of Israel at this time, it has proven very effective in the areas where it is deployed. It is credited with the fact that despite HAMAS's more lethal rockets, no Israelis have been killed thus far. On the other hand, the Palestinians in the Gaza Strip have chosen not to develop a warning system or build shelters. Of course the damage between an established state with professional armed forces employing state of the art weaponry against a relatively untrained guerrilla force trapped in a small, congested urban environment will be disproportionate. The solution to that disproportionate bloodshed and damage? Stop firing rockets - today. The Israelis have no interest in mounting a ground incursion into Gaza, but they will if they think there is no other way to halt the rocket attacks on Israel. This will not end until one side blinks. It does not look like it will be the Israelis. Senator Carl Levin of Michigan, Chair of the powerful Armed Service Committee sent letters to the senior U.S. uniformed military leadership asking them "for their opinions" on the release of what have now become known as the "Taliban Five" in exchange for the release of U.S. Army Sergeant Bowe Bergdahl, a soldier held captive by the Taliban since 2009. A key quote from Senator Levin: "Each of these military leaders emphasized a simple principle – America does not leave its troops behind. The unanimous support of the Joint Chiefs for securing Sergeant Bergdahl’s release is a powerful statement on the importance of that commitment. I give great weight to their views, and I believe it’s important for the American people to hear them." Unanimous support? For the recovery of Sergeant Bergdahl - yes. For the release of the detainees - not so much. I understand that Senator Levin is a politician and this was basically a political exercise, but I think some comments about this request and the nature of military service are in order. The Chairman and Vice Chairman were involved in all aspects of the decision, so of course they support it. The other five (the four service chiefs and the National Guard chief), of course unanimously support the efforts to gain the repatriation of an American being held by hostile forces - that should come as no surprise. However, none of them were consulted before the decision was made to release the Taliban detainees in exchange for Sergeant Bergdahl, nor were aware of the operation to do so until it was over. They stated that in their responses and mostly declined to pass judgement on the wisdom of releasing the detainees. It is not surprising that the four service chiefs were not asked for their input to the decision. Since the implementation of the Goldwater-Nichols Act in 1986, the chain of command flows from the President as Commander in Chief to the Secretary of Defense to the combatant commander (in this case, commander of the U.S. Central Command). Note that the Vice President, the Chairman of the Joint Chiefs of Staff and the service chiefs are not in the operational chain of command. The Chairman provides advice to the President and Secretary of Defense, and executes the orders. The service chiefs train, equip and organize their respective services and provide trained and equipped units to the combatant commanders. When these senior officers are asked by a Senator if they support a decision of the President/Commander in Chief, they are obliged to answer the question. It is important to consider that these officers serve at the pleasure of the President, and work either directly or indirectly for the Commander in Chief. Israel prepares for an incursion into Gaza - but will they do it? 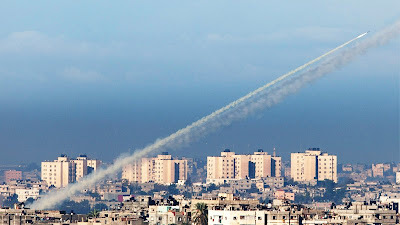 Israel has certainly not been subtle in signaling its preparations for a possible ground incursion - a polite word for an invasion - into the Gaza Strip to attack elements of HAMAS* who have been firing hundreds of rockets into Israeli cities. Up to 40,000 reservists have been alerted and front-line units (including the elite Golani Brigade) have been deployed to the border with Gaza. If the order is given to mount an invasion, the Israel Defense Forces are extremely capable, well-trained, well-equipped and well-led. They will of course be opposed by a determined - sometimes bordering on fanatical - experienced guerrilla force. There will be casualties on both sides, but we should not be under any illusion as to who will suffer the most casualties. 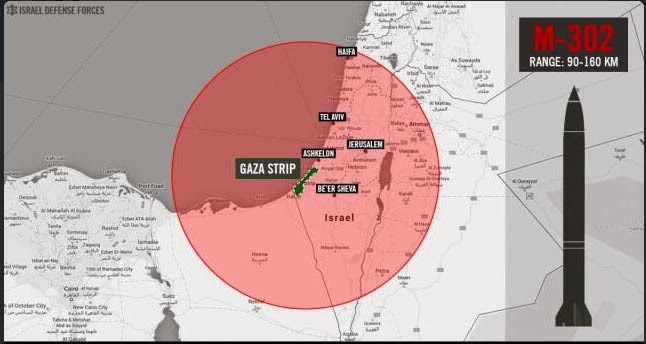 Not only will there be loss of life on both sides, the Israeli incursion will severely damage the Gazan infrastructure. There will be no equivalency of the levels of damage on the two sides. It has always been that way - the Israeli troops will inflict massive damage in a short amount of time. The incursion will likely follow the usual Israeli tactics. Note the tracked vehicle that resembles a tank without a turret in the foreground of the above photograph. That is an armored engineering vehicle based on Israel's former Chieftain tanks. These vehicles normally are the first to cross into hostile territory - their mission is to create a safe passage for the following armor and infantry forces. The combat engineers remove obstacles, disarm booby traps and IEDs, remove minefields, etc. It is a difficult, dangerous job. All of this will be covered by Israeli Air Force fighter bombers and very accurate artillery. Even the Israeli Navy will play a role, conducting naval fire support and possibly commando operations from the Gazan littoral. If history is any guide, the Israelis will launch a multi-axis assault. In addition to the air and naval attacks, the Israeli Army will attack from the north and the east, pushing into Gaza to cut the Strip in two, isolating the Gaza City area in the north from the Khan Yunis area to the south. Then they will begin moving through the two sectors, eliminating as many HAMAS rockets, launchers, fighters and facilities that they can. Unfortunately, many HAMAS facilities will be co-located with sensitive civilian venues - mosques, schools, hospitals, housing areas, etc. That said, what will be the objective of an Israeli incursion? Of course, the stated objective is to stop HAMAS from firing rockets at Israeli cities. That is nothing new - we saw this in 2009 and again in 2012. However, 2014 is a bit different. HAMAS has acquired a much more lethal capability: Chinese-designed, Syrian-built long-range M-302 artillery rockets that can reach almost any spot in Israel. A few comments on the M-302. Many in the media refer to this as a missile, however it is a rocket - missiles carry an on-board guidance system; the M-302 does not. The confusion is understandable - the Arabic language offers no distinction. The rocket can deliver a 385-pound warhead to a range of 100 miles. These are the rockets HAMAS is launching at Tel Aviv and Jerusalem. Yes, Jerusalem, the city holy to Jews, Christians and Muslims. The M-302 is not accurate enough to launch at one of the world's most revered cities and be sure of not hitting a site that may be holy to well over half the inhabitants on the planet. It has been interesting to watch the performance of the largely U.S.-funded Iron Dome defense system - it has proven itself to be very effective, however, it cannot cover the entire country and intercept every rocket. Unfortunately, in the Israeli optic, the only way to prevent further damage to Israel is to invade Gaza and root out the rockets, launchers and HAMAS fighters. I have seen no indication that Israeli Prime Minister Benjamin "Bibi" Netanyahu is bluffing. In the wake of the murder of three Israeli teens that they have blamed on HAMAS, Netanyahu feels he has the moral authority, public support and political capital to move against HAMAS at this time. It could happen anytime now - all it takes is the order from the Prime Minister. * HAMAS is an acronym for حركة المقاومة الاسلامية, harakat al-muqawamah al-islamiyah, or the Islamic Resistance Movement. I wrote this article in late 2012. It seems that we have to go through this recurring situation every few years. Here we are in mid-2014, still addressing the same issues. What I wrote then is still true today - the rockets still threaten large parts of Israel. By way of updated figures, according to the Israel Defense Forces, there were 2,248 rockets fired into Israel in 2012, only 41 in 2013, and thus far in 2014, well over 500. The 2014 numbers grow by the hour and may surpass the 2012 total as both sides gear up for a major confrontation. The catalyst for this round? The murders of three Israeli teens and a Palestinian teen in what appears to be a revenge killing. Palestinian rocket attacks trigger Israeli airstrikes, and the cycle of violence continues. 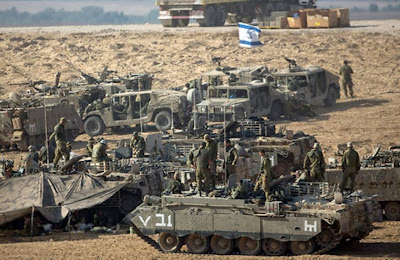 Israel has called up a number of reservists in preparation for a possible ground incursion into Gaza. Please take a few minutes to re-familiarize yourself with what I wrote 20 months ago. It remains frustratingly current. Israel has few options in its dealings with HAMAS* and the Gaza Strip. The recent increase in violence has forced the Israelis to order air strikes against targets in the territory and prepare for a ground incursion reminiscent of the operation four years ago. The number of rockets fired at Israel from the Gaza Strip is quite astounding. To recap, since the end of the fighting in January 2009, there have been more rockets fired each year than the previous year. In 2009, there were 300 fired, in 2010 there were 510 fired, in 2011 there were 615 fired, and thus far in 2012, there have been at least 900 fired. Over 400 of those 900 have been fired in the last week. Over 150 were fired on November 16 alone. It's not just the quantity of rockets, it's the quality. In the fighting in late 2008 and early 2009, the only rockets in the HAMAS inventory were the home-made, not very effective Qassam rockets with range capabilities between three and 12 miles. The short range of the rockets placed the Israeli border cities in jeopardy, especially the city of Sderot. See my article written in January 2009 after I visited Sderot during the fighting, Sderot - Israel's "Rocket City". Since 2009, HAMAS has significantly upgraded its rocket arsenal, acquiring longer range systems from Iran, smuggled in via the Sinai peninsula under the "watchful eyes" of our erstwhile allies, the Egyptians. This includes Iranian Fajr-5 rockets that were used by Hizballah against northern Israel in 2006. The Fajr-5 has a range of almost 45 miles, placing Tel Aviv and Jerusalem in range. This week, HAMAS crossed an Israeli red line - it fired rockets at Tel Aviv and Jerusalem. Another attack killed three Israelis in the southern city of Qiryat Malachi. It was too much for the Israelis to absorb. It also reinforces the perception among Israelis who live in the southern part of the country that until the people in more upscale Tel Aviv or Jerusalem are threatened, the government ignores the plight of the average Israeli. The Israelis began a series of air strikes in Gaza. The Israelis have been continuously collecting intelligence on the Gaza Strip - they have a huge catalog of targets to be struck. The initial targets, of course, are the longer range rocket systems, particularly the Fajr-5 launchers. HAMAS is a capable enemy - they are hiding the launchers in mosques, schools and other areas that the Israelis are reluctant to strike. World public opinion is never on the side of the Israelis, so they have to hold themselves to a much higher standard than the Palestinians. Since many of the launchers may be in areas that cannot be attacked from the air without unacceptable civilian casualties, a ground incursion may be necessary. The Israeli cabinet authorized a call-up of up to 30,000 reservists. Of that, 16,000 have been mobilized. That will free up active duty units to move towards Gaza. The minister of defense is seeking authority to call up as many as 75,000 reservists. The units that have deployed to the border are among the best in the IDF - the Givati Brigade, the Paratrooper Brigade, and the 401st Armored Brigade. The 401st is equipped with the latest Merkava-4 tank. The quality of troops moving towards Gaza and the reserve call-up indicate how serious Israel is taking the matter, and how likely it is that they will invade Gaza. Mobilizing reservists in a small country like Israel is expensive and disrupts virtually everything. These steps are not taken lightly. Israel has rushed into service as many Iron Dome anti-missile batteries as it can. The system has been able to defeat dozens of inbound HAMAS rockets. The country is fast assuming a war posture. Likewise, in Gaza, residents are stocking up on food, fuel, water, etc., since they too know that an Israeli incursion is not only possible, but inevitable. We seem to go through this drill every few years. The Israelis endure as many attacks as they are willing to tolerate, then conduct a punitive operation against Islamist elements in Gaza. Predictably, there will be a huge public outcry of the disproportionate nature of the response, the United Nations will call for a cessation of the violence (that's code for demanding Israel stop, but not so much the Palestinians), and Israel will stop short of destroying HAMAS's ability to fire more rockets. * HAMAS, (حماس) Arabic for enthusiasm, is an acronym of the Arabic titleحركة المقاومة الاسلامية harakat al-muqawamat al-Islamiyah, the Islamic Resistance Movement. The battle for Tikrit - bellwether of the future in Iraq? The ongoing battle for control of the city of Tikrit between the forces of the newly-declared The Islamic State (TIS, formerly ISIS - the Islamic State in Iraq and [Greater] Syria) and the Iraqi Army has implications far beyond who emerges as the victor of the fighting. It is a make or break battle for the discredited Iraqi Army and the government of Prime Minister Nuri al-Maliki. Tikrit is a Sunni city of 250,000 people located on the Tigris River about 85 miles north of Baghdad. It is famous for being the hometown of former dictator Saddam Husayn, who lavished significant amounts of money and largesse on the city. The city was taken with little opposition by the forces of ISIS soon after the fall of Iraq's second largest city, Mosul, in mid-June. ISIS forces seemed to be rolling down the Tigris Valley on their way to Baghdad as Iraqi military and security forces collapsed and melted away. ISIS forces soon made their way to the city of Ba'qubah, a mere 25 miles northeast of Baghdad, and were already in control of al-Fallujah in the infamous al-'Anbar province about 30 miles west of Baghdad. The Shi'a holy city of al-Samarra', south of Tikrit on the Tigris, was in danger of falling to ISIS. As the Iraqi government withdrew most of its forces positioned in the Euphrates River valley west of Baghdad back to the city to defend the capital in case ISIS mounted an attack, it deployed forces north into the Tigris Valley to retake the city of Tikrit. Tikrit is home to al-Sahra' Army Air Base, formerly called COB Speicher by the Americans. It is also home to a university and two civilian airports. The military air base has been the scene of an intense ongoing battle between TIS fighters and the Iraqi Army. Based on the reports from the TIS fighters (they are avid Twitter "tweeters"), they have been somewhat successful in taking the Air Force College portion of the base (circled in red on the map on the airbase). It does not appear that TIS forces are taking prisoners, preferring to kill any Iraqi military personnel they come across. They believe most of them to be of the Shi'a sect, and thus apostates who deserve to die. Fighting also continues in the university area and in the city itself. Tikrit is not the only venue for fierce fighting between the Army and the Islamists. Here is a map of the rest of the combat area. 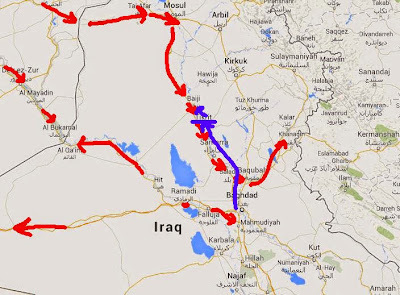 The Islamist forces seem to be moving both east and west in the Euphrates Valley from their stronghold in al-Falujah, consolidating their hold on al-Ramadi to the west - they have already taken the border crossing at al-Qa'im and the strategic crossroads of al-Rutbah which controls the highways to the Jordanian border crossing at al-Turaybil and the Syrian border crossing at al-Walid. Complementing the move to the border crossing at al-Qa'im is an effort by TIS forces in Syria to replace the al-Qa'idah affiliate Jabhat al-Nusrah (Victory Front) as the primary force in the Dayr al-Zawr to Albu Kamal corridor on the Euphrates River. When the two elements meet up, TIS will control a large portion of the Euphrates Valley from the Turkish-Syrian border to the outskirts of Baghdad. Surprisingly, the TIS fighters are also pushing up the Diyala River valley towards the Khanaqin reservoir, an important hydroelectric power production and oil field area. By doing so, it is approaching the Kurdish autonomous area. I would be surprised if the Islamists want to start a fight with the Kurds at this point in time. Watch what happens in Tikrit. If the forces of The Islamic State are able to push the Iraqi Army back towards al-Samarra' and Baghdad, the failed state of Iraq may not recover in its current form. We should prepare for the dissolution of the country and the presence of a radical Islamist state between Aleppo and Baghdad. In a recent press conference, Chairman of the Joint Chiefs of Staff General Martin Dempsey admitted what many of us Middle East military analysts have feared: Iraqi military and security forces do not have the capability to expel the radical Islamist forces now calling themselves the Islamic State, or the Ibrahim Caliphate. This is troubling on several levels. Following the rapid successes of the Islamic State in Iraq and [Greater] Syria (ISIS), the United States has deployed hundreds of military advisers to Iraq, as well as moving a small force to help secure Baghdad International Airport and the highway between the airport and the International Zone, location of the U.S. Embassy. The airport will be critical to any evacuation of embassy personnel, civilian contractors and American citizens - the numbers may be in the thousands. Dempsey was joined by Secretary of Defense Chuck Hagel, who basically parroted the Administration mantra: "President Obama has been very clear that American combat troops are not going to be fighting in Iraq again." He explained that the American troops currently in Iraq are only advising Iraqi forces and assessing the strengths and weaknesses of Iraqi military and security forces, as well as the capabilities of ISIS fighters. The secretary did acknowledge that if President Obama orders airstrikes, "their mission could change." Okay, so we have the Secretary of Defense and the Chairman of the Joint Chiefs tap dancing around the obvious. I think it is a given that the mission is going to change. Why do I think that? Secretary Hagel claims that he is not aware of the initial assessments of the Iraqi forces' capabilities. Maybe, maybe not - General Dempsey would not have made the statement that Iraqi military and security forces are incapable of retaking the large swath of Iraqi territory now in ISIS hands without "outside help" unless he had information leading him to that conclusion. For the general to drop such a bombshell in a public setting tells me that the initial reports from the American officers now taking stock of the condition of the Iraqi armed forces are not good. If the Iraqi Army of 250,000 soldiers organized into 14 divisions, equipped with tanks, armored fighting vehicles, artillery and helicopter gunships cannot dislodge a force of maybe 10,000 Islamist irregulars, we are about to have a major foreign policy disaster on our hands. It is absolutely essential that the Islamic State, the Ibrahim Caliphate or whatever they chose to call it, not be permitted to own territory and assume the status of a country. They have already organized the Syrian and Iraqi territory under their control into administrative divisions with Islamic councils and Shari'ah courts. This is reminiscent of the Taliban government in Afghanistan in 1996, which became a breeding and training ground for radical jihadi terrorists. We should assume that at some point the United States or American interests (military facilities, Navy ships, businesses, airliners, etc.) will become targets of this new "state." 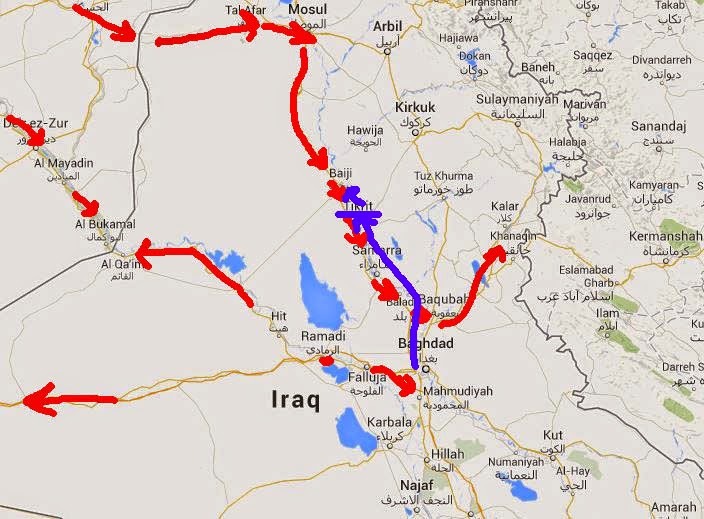 So, if the Iraqis can't retake their own territory and require "outside help," just who is that going to be? The secretary and chairman said they were still considering what military options they will recommend to the President, and what role American forces will play. General Dempsey said one option under consideration is providing greater assistance than the approximately 750 U.S. troops now in Iraq. When asked for clarification on just what that means, he replied, "That's not a question that we’re prepared to answer just yet." If I were the general, I'd start getting ready to answer that question. Earlier this week, the Department of Defense announced the deployment of as many as 300 additional American troops to Iraq, this time specifically as a force to help secure Baghdad International Airport. It is no secret that access to the airport is a key part of the plans for the possible evacuation of thousands of staffers at the American Embassy, American citizens and civilian contractors from the city should the situation worsen. 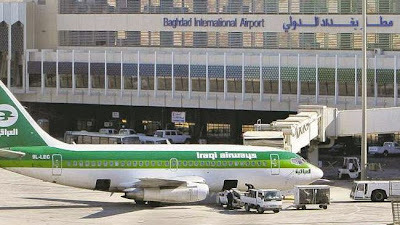 To get to the airport from the embassy, located in downtown Baghdad in the area formerly referred to as the Green Zone (now officially called the International Zone), travelers must transit the almost eight mile Baghdad Airport Road. The highway to the airport was commonly referred to by American troops as Route Irish. At one point, it was a treacherous section of roadway often targeted by Iraqi insurgents prior to enhanced security measures along the route. Following the withdrawal of American forces in 2011, these security measures have not been maintained to those previous standards. Evidently, the forces of the Islamic State/Islamic Caliphate (formerly the Islamic State in Iraq and [Greater] Syria) realize the importance of the airport and the airport highway. Here are two claims from the Islamist group, which if true - stress that IF TRUE - indicate an awareness of that fact. The Arabic text reads: "Urgent - the State of the Caliphate is now targeting the Baghdad airport and making direct hits, praise God." "Detonation of two IEDs against the pagan army in al-'Amiriyah (west Baghdad) - Detonation of an IED against the army in al-'Amiriyah (west Baghdad) on 4 Ramadam 1435 (July 2, 2014) resulting in the deaths of two of their personnel. When a patrol came to provide support, detonation of the second IED and through the grace of God killed and injured some of them, praise to God." It is imperative that the airport and Baghdad Airport Road be secured. If the Iraqis cannot do it, it then becomes another mission for the U.S. troop contingent. If that is the case, they will need additional forces. Is Iran delivering fighter aircraft to the Iraqi Air Force? A video posted on July 1 on several websites claims - mistakenly, I believe - to be in-flight footage of the former Russian Sukhoi Su-25 (NATO: Frogfoot) fighter aircraft that were delivered to Iraq on June 28. Getting the aircraft into the air that quickly would be impressive. For information on that delivery, please see my article, Russia delivers first of five Sukhoi Su-25 ground attack fighters to Iraq. According to The Aviationist, the seven aircraft included four Su-25KM and three Su-25UBKM - the KM indicates an upgraded variant of the ground attack/close air support fighter; the UB indicates a two-seat trainer version of that same variant. In this video from the Iraqi Ministry of Defense - captioned "Arrival of the second batch of Sukhoi aircraft to Iraqi territory", two Iraqi lieutenant generals, including the commander of the Iraqi Air Force, Staff Lieutenant General (Pilot) Anwar Hamid Amin (the second speaker) are on hand to welcome and accept delivery of the aircraft. The generals explain that this is the second batch of five (sic) Su-25 fighter aircraft that will provide added capability to support Iraqi ground forces. They claim the aircraft have entered service and will begin flying combat and reconnaissance sorties as early as tomorrow. According to the air force commander, Iraqi pilots will be flying within 72 hours against ISIS and al-Qa'idah wherever they are in Iraq. What the generals fail to mention is where the aircraft came from. They obviously just flew in - they were not delivered by cargo aircraft as the first delivery on Saturday night. At 3:40 in the video, you can see the traditional welcoming firehose spray - a short flight from an Iranian air base makes sense. 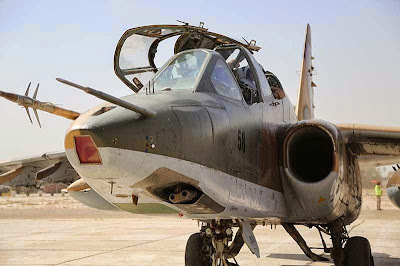 Compare the photo at the beginning of the article - it is an IRGC AF Su-25UBKM - with the photograph of the aircraft that has just been flown to Iraq. Note the style of number on the nose, and the present lack of the IRGC logo on the tail. I do have a question about the Iraqi pilots. The Su-25 aircraft has not been in the Iraqi inventory for at least a decade - are their pilots still qualified to fly the latest variants of this aircraft? Did they receive training in Russia, or possibly Iran? How long has this aircraft delivery been in the works? Remember that in 1991 during Operation Desert Storm, Iraqi President Saddam Husayn ordered his air force to fly over a hundred aircraft to Iran to prevent their destruction by American air power. Of those, seven were Su-25 fighters. Coincidence that seven were just delivered (or returned)? Has the "Shi'a Air Force" now arrived in Iraq? ADDENDUM: It appears that the BBC agrees with my analysis.